I always jump into projects without being properly prepared. So this week when I had some time, instead of starting yet another project only to get frustrated when things didn’t work out perfectly (usually due to my lack of prep), I instead decided to do some tuning up. 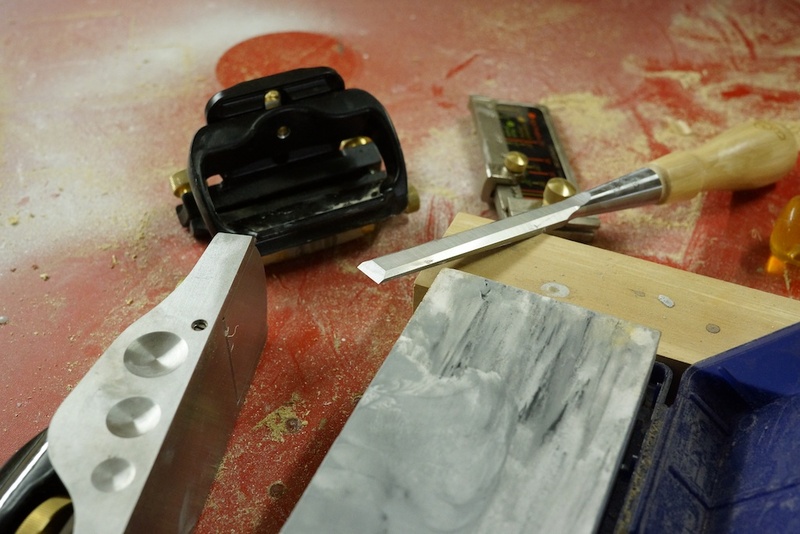 I started with making a zero clearance insert for my table saw, but I didn’t have the right material, so instead I decided to sharpen. Over the past 6 months I’ve acquired several planes and a set of chisels shortly after Christmas. Some have been sharpened, some not, some half way, so I spent a couple of nights sharpening and tuning everything up. Sharpening really isn’t so bad, I somewhat enjoyed it as I could see the tools performing better as I put more work into them. Next week I’ll do a little project, still waiting for work to wind down before I start anything big. I’m Back…. 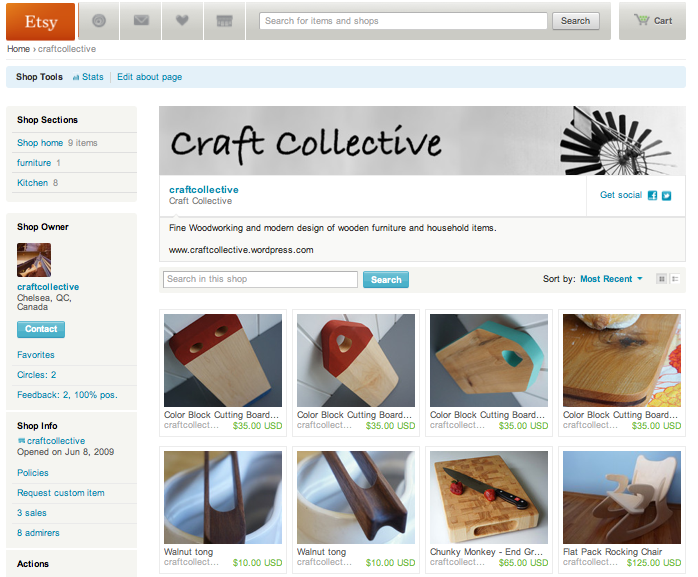 and Stuff is selling on Etsy! Been gone the last while as I’ve been up to my ears in house reno’s, followed by getting a job which seems to take up almost all of my free time. Last night after working all day, then shovelling off the roof (because I haven’t reno’d it yet and it leaks) and then shovelling the driveway, I decided to head out to the workshop and build a quick melamine box for the microwave. After an hour, I had wasted several sheets of melamine, and had a pile of sawdust and screws to show for all my work. Went to bed very discouraged, how could I not make a simple box? Luckily in the morning, a surprise couple of Etsy sales came to the rescue. Nothing like someone liking your stuff enough to pay for it to get you out of the dumps. I went back in tonight finished the box, plus some signs I needed to do, and even got started on another cutting board as my Etsy listings are running a little low lately. I feel a million times better tonight, hopefully more time opens up this weekend for me to continue working on projects. I find the more time I take off woodworking the more I forget how to do, and the longer it takes me to get back in the grove. 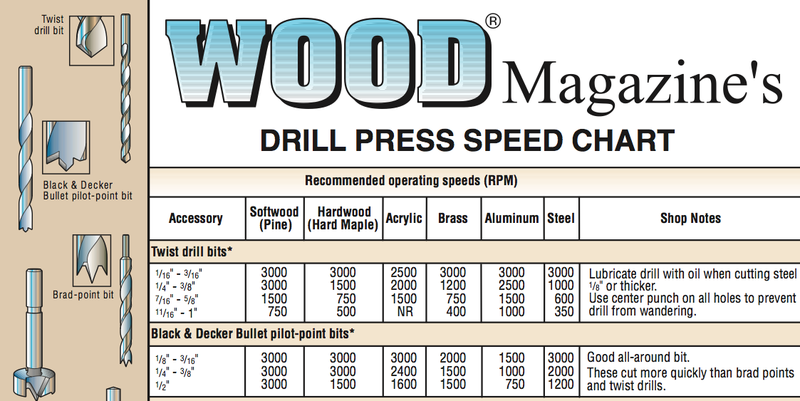 I don’t know about you, but while I thought it was great that my drill press could run at a variety of different speeds, I can honestly say that I’ve never changed the speeds in the 5 years that I’ve owned it. Now don’t get me wrong, this isn’t due to laziness, being self taught, I had no clue why a certain speed would be better for certain bits and materials. See the complete chart here. 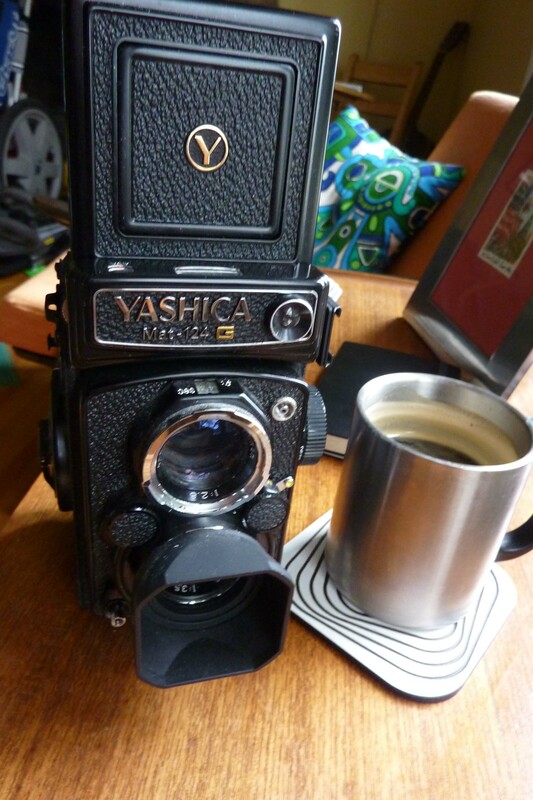 I bought a Yashica 124G a couple of years ago off of Ebay. It was an amazing deal as the seller spelt Yashica incorrectly, so I was the sole bidder (he also listed it in the “film” section, not the “film camera” section). The camera arrived in absolute mint condition except for a small scratch on the back and a non-working light meter. On a Yashica TLR, the light meter turns on when you open the top. 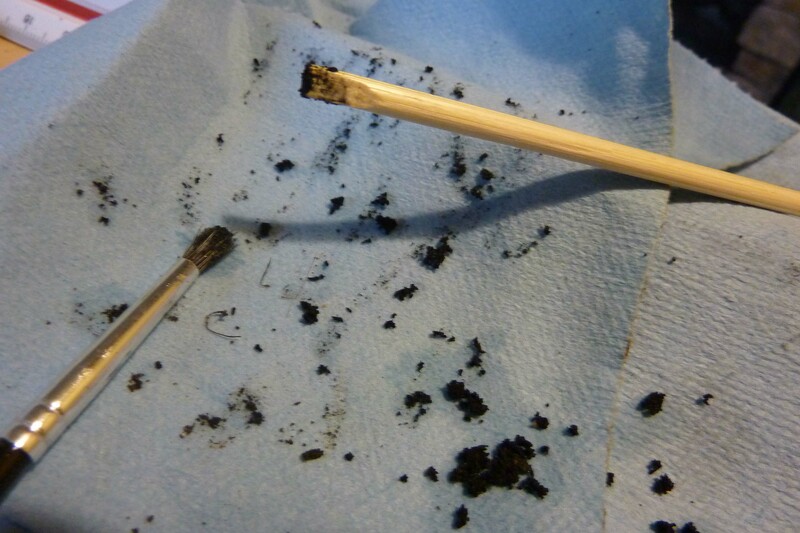 Upon taking the top apart, it was discovered that the switch was simply sticky from having sat closed for many years. It’s always nice when it’s a simple repair! I’ve taken many rolls of film with the Yashica, both 120 and 220. Something I could never figure out was that I often got strange red stripes across my pictures. This only ever happened on colour film. I initially suspected the film as I had some rolls of 220 that were recently expired but always cold stored, as well as some rolls I got off ebay that were incredibly cheap. I asked around and a few mentioned xray damage, but nothing conclusive. Finally I posted the question on the I Shoot Film group on Flickr. For those of you who have never used the groups on flickr, I find they are an amazing resource as you get answers to your questions from across the globe. As you can see, 8 replies later and the problem was solved! Turns out the colour film I was using was all 220, meaning there is no paper backing for the majority of the film. The red streak was actually because of a light leak, likely on the top hinge. 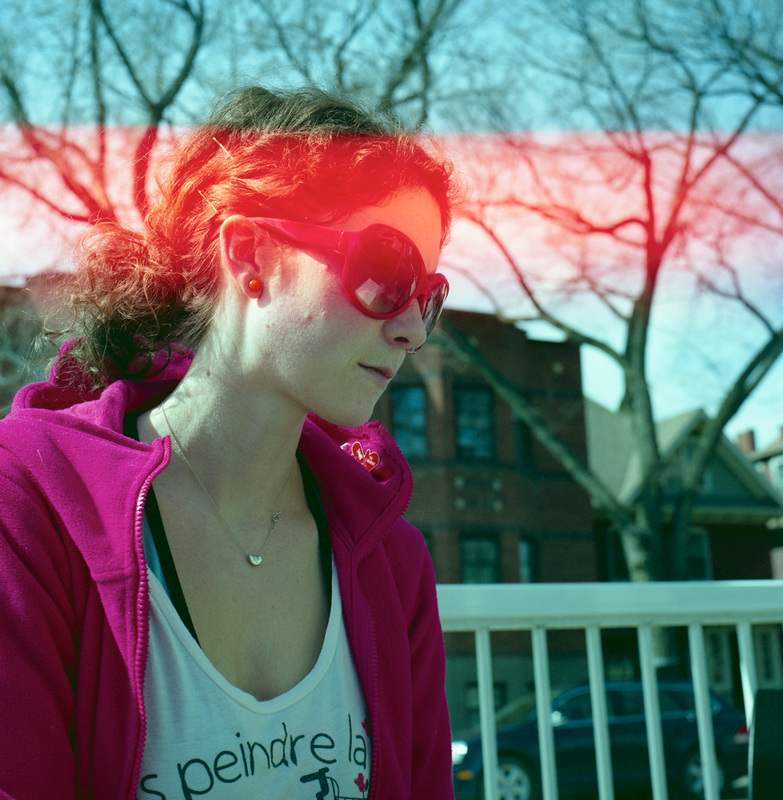 I compared the light seal in my Yashica (what was left of it) to my Seagull (used in the Pan-o-gull experiment). The Seagull actually uses black yarn as a light seal, leading me to believe that I didn’t need to buy a special Yashica light seal kit. A search of the net brought me to this site which suggested that you could replace the seals with some sticky back felt which I just happened to have left over from the Pin-Cube. 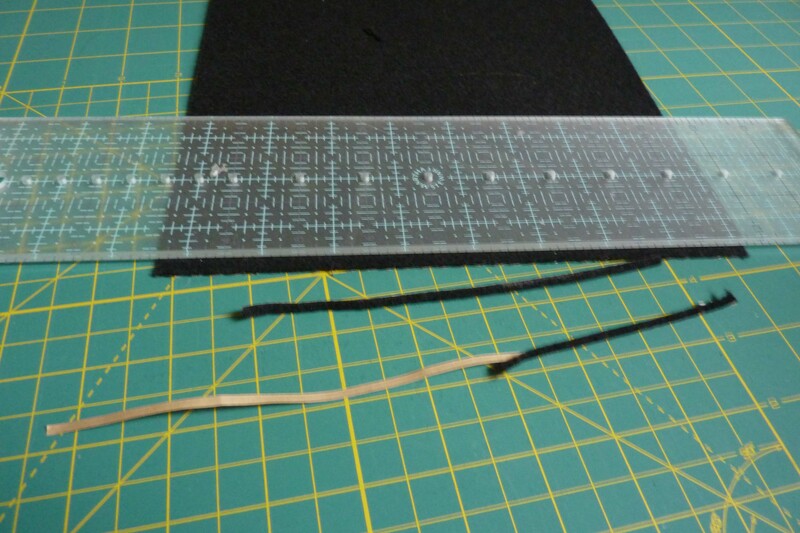 Using a cutting mat and straight edge, I cut strips of black felt. 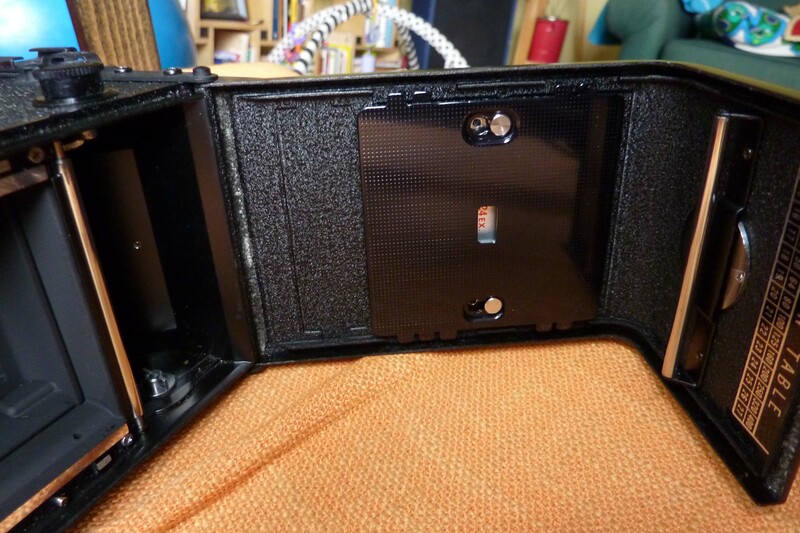 I then set about cleaning out the old left over light seal off of the camera. What was left of the seal was bits of sticky black foam. There wasn’t much left but it still made a mess. The professional light seal kits come with a “special tool”. It’s basically a slim piece of wood to help push the seal into the grove. I simply took a bbq skewer and with a chisel shaved the end flat so that it would fit in the grove. 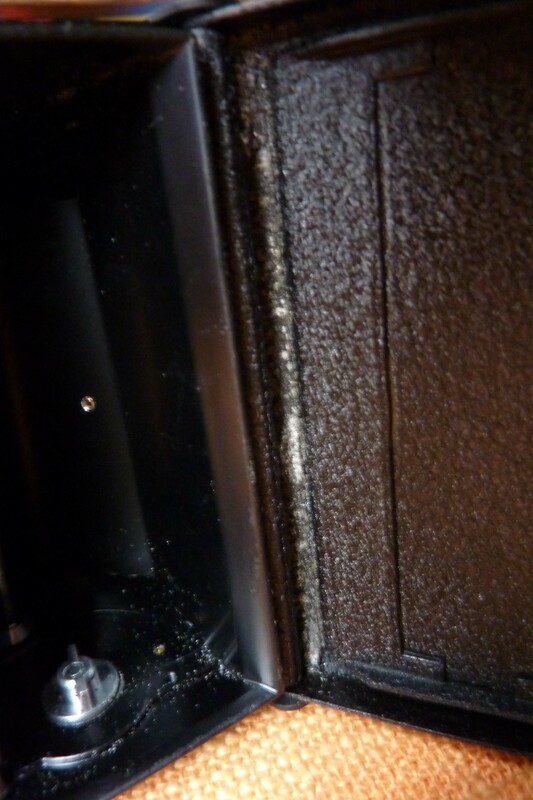 To remove the stickiness I used mineral spirits. Not sure if this is the best thing to use, but I had it lying around and it seemed to work ok. It was a bit tricky getting the new felt into the thin groves around the camera, but with a bit of patience, I was able to get it all in in under 15 minutes. Once finished, I realized how bad the old seals were and I’m sure the new felt can only be a huge improvement. Looking back at some old 120 BW negs from this camera it was obvious that it was actually leaking along both sides as well, not enough to affect the pictures, but it was only going to get worse. As far as DIY camera repair goes, this was a pretty simple job, highly recommend anyone with this issue to try the repair themselves. 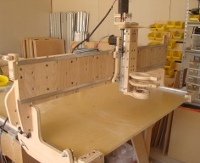 DIY CNC machine? Build it yourself! A CNC machine is basically a router that moves in all three axes over top of a material to carve out the shape that you desire. The router is controlled by a computer so that very precise and consistent cuts can be made. I have wanted a CNC machine for about 10 years now, so what’s stopping me? Well they cost about $10,000. So until I have a lucrative furniture design business, this isn’t likely going to happen. Unto this Last makes all of their creations using a large format CNC machine. The materials are plywood or other sheet goods and the computer optimally cuts out all the pieces. 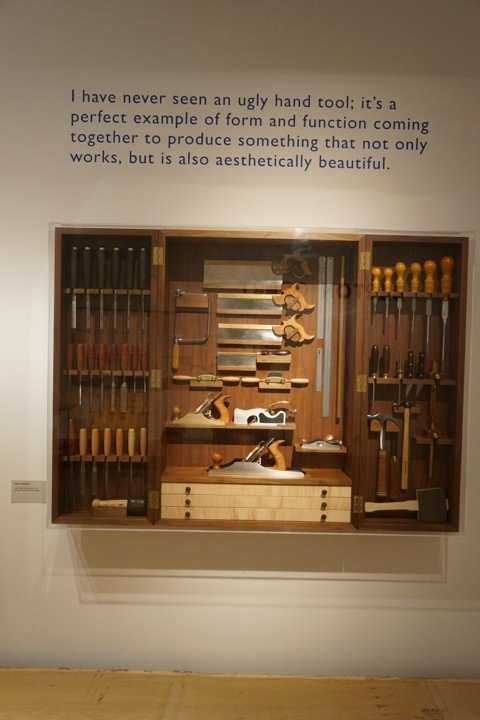 This is a key element to their products as they can arrange the cuts so as to not waste any material whatsoever. 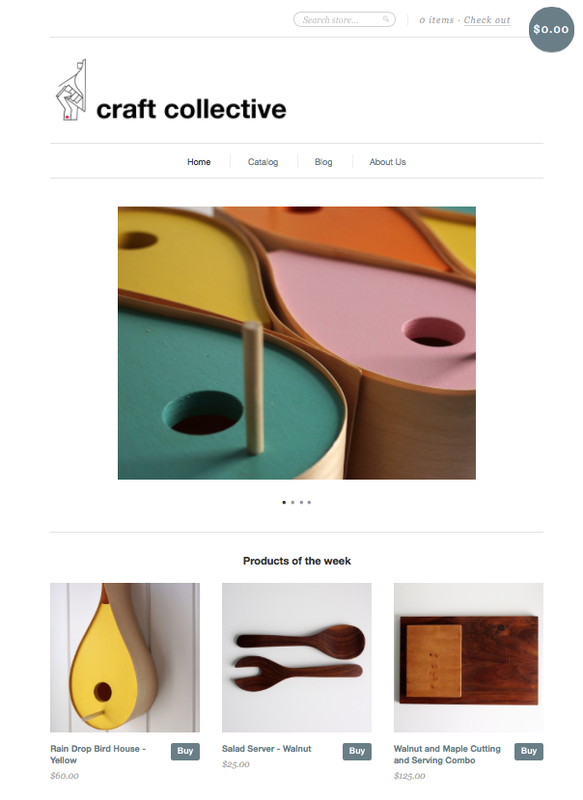 My next step was to visit their website where they had vast tutorials and how to’s involving DIY CNC machines. The site is being constantly updated and has tons of helpful stuff on it. It’s nice to see feedback from other DIYers saying what works/doesn’t work on their machines and simple work arounds. Finally I couldn’t help myself, I went online and bought their newly written book Build Your Own CNC Machine. I’ve read it all the way through already! The book is well laid out with easy to follow instructions as well as helpful suggestions on where to buy some of the more hard to find parts (motors, etc.). The design in the book is for a 2’x4′ machine, however the website shows bigger versions as large as 4’x8′. So what’s my next step? Well, I obviously can’t get started on this till after our Parisian excursion, but I’m planning on building this in the fall. I’ve already set aside some money for the electronics, while I have most of the wood already laying around the garage. I’d like to see if I can upscale the design to build it for a 5’x5′ sheet so that I could use sheets of baltic birch. Over the summer I plan to do some reading and playing with CAD programs as well as work on some designs to test out the new machine once it’s built.